Please select one of the options below to support The Spaatz Association. Each year, The Spaatz Association presents its Aerospace Leadership Scholarships to Civil Air Patrol who dream of taking flight. In 2014, we expanded our programs to include a new Leadership Grant program for individuals and units. Each scholarship or grant helps develop cadet leadership abilities and create LEADERS for the 21st Century. 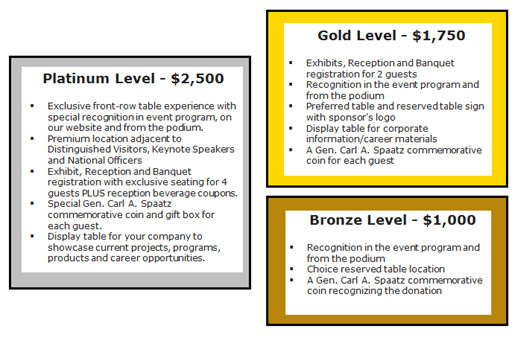 Scholarships are awarded each March at our Mid-Winter Dinner, and grants are awarded quarterly. Since 1999, we have allocated more than $100,000 to cadet leadership development, and we need your help to continue the tradition…. Online Donation – The easiest way to donate to The Spaatz Association is online! Click the online link to visit our PayPal general donation page. We can accept up to $10,000 online, and you can print a receipt directly from your computer. For larger amounts, please contact contact us. Electronic Funds Transfer – The Spaatz Association can also supply routing and account numbers for the fast and efficient wire-transfer of your generous donation. For more information on electronic funds transfer, please contact us. Invoicing – The Spaatz Association can send an invoice to your company in the amount and at the frequency you specify. Some companies prefer a monthly, quarterly or annual invoicing for budgetary reasons. TSA will furnish a W-9 document with our federal EIN and mailing address for your accounting office. TSA will also be happy to furnish a copy of the IRS letter confirming our 501(c)3 tax-exempt status. For more information on corporate invoicing, please contact us.